CEJ Expansion Joint Library :::: Custom Expansion Joints, Inc.
How do you best define system media? How does temperature affect your expansion joint? Why do fly ash barriers add longevity to an expansion joint? Why is the baffle an important addition to an expansion joint? We’d like to share a library of knowledge to assist you in the complex development of expansion joints. It’s this knowledge that makes Custom Expansion Joints, Inc. different. And it makes CEJ the leader in ‘reduced failure’ and 100% satisfaction. Feel free to bookmark our CEJ Expansion Joint Dictionary for future reference. It’s a great resource, especially, when filling out our data sheets. 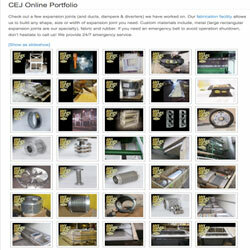 At CEJ, we dedicate our efforts to provide quality custom expansion joints, to all of our customers. No job is too big or too small. Call us today to start the design process at 1-800-235-9259 or, feel free to email us too. Feel free to contact us any time, day or night. We monitor our phones even on nights and weekends.